I struggle with voice too and love stories where the voice shines out. Sounds like a book to add to my huge TBR list. This is on my to-read list and a copy is on reserve at my local library when they catalog and process their brand-new copy themselves! Yay, Barbara! Hope you enjoy reading it. I read this one recently and loved it. Followed it up with an older but similar title, ALSO KNOWN AS HARPER, which I review for next week's MMGM. The voice really does shine in both of these. Thanks, Akoss! Glad you loved it too! I love the cover on this one. The story sounds great. Thanks for telling me about it. I will definitely check it out. Isn't that a great cover, Rosi? Thanks for stopping by. This is on my TBR list too. I've been hearing such great things about it--and I'm fascinated by the Emily Dickinson tie-in. Plus, the author lives in my state! Thanks for a great review as always! I heard a lot about this book on Twitter, believe it or not, before I ever bought my copy. Oh, how cool that you and Robin both live in Oregon. I've always wanted to go there. This one has popped up repeatedly on my radar, and finally last week I brought home a copy! Now I just need to find time to read it, so thanks for the nudge on that. :D And enjoy your screen free week! Thanks, Suzanne. Enjoy the book (when you find time to read it). I know Robin in real life,. 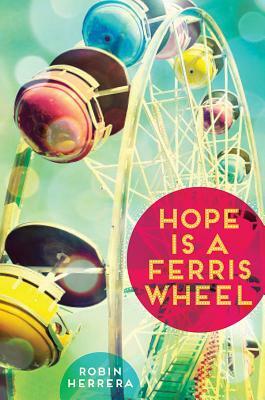 and she is as funny as you would think, after reading Hope is a Ferris Wheel. Thanks for the review, Joanne! You are so lucky, Michael! She must be fun AND funny. Thank you for the Twitter shout-out. I read an ARC of this and loved it. Of course you do, Jess. It's a wonderful book. Hope you get a chance to read it soon. This sounds like a great read and I love that Star finds poetry! Great cover too. :) How wonderful that the voice of the characters really come through. Thanks for sharing! Thanks for the reminder about screen free week. Did a whole lesson on it and then promptly forgot! Never really a problem for me, though.